Explanation: Fading sunlight, a young crescent Moon, and brilliant Venus shared the western sky in this view of 2005's final sunset from the top of Mount Haleakala, on Maui, Hawaii. Also known as the Sacred House of the Sun, Haleakala, is Maui's dormant volcano. 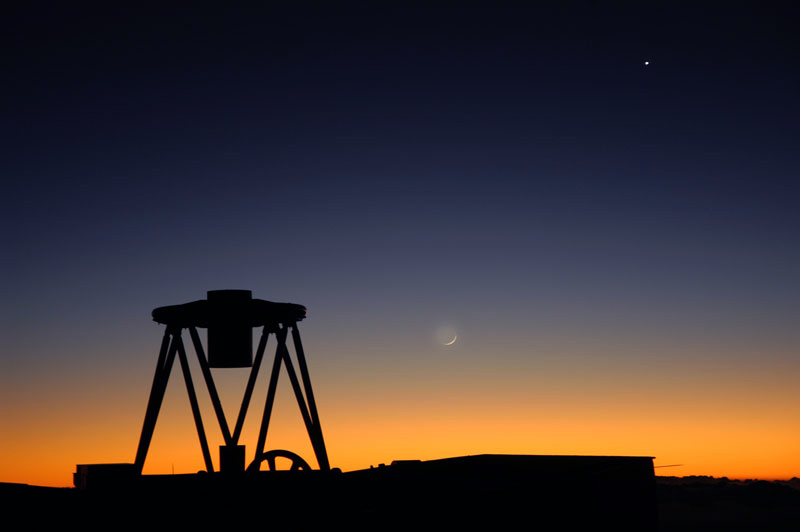 At 10,000 feet the summit is an ideal site for astronomical observatories, and this scene also features the silhouette of the northern hemisphere Faulkes Telescope. Of particular interest to students the Faulkes Telescope is a 2-meter diameter instrument, dedicated to astronomy education, that can be remotely operated over the internet. The project is a joint effort between the Dill Faulkes Educational Trust and the University of Hawaii Institute for Astronomy. Of course on Haleakala, "Happy New Year" would be "Hauoli Makahiki hou" (how-oh-lee ma-ka-hee-key ho).